the boo and the boy: GRAPHIC CONTENT! Brain tumour incision! GRAPHIC CONTENT! 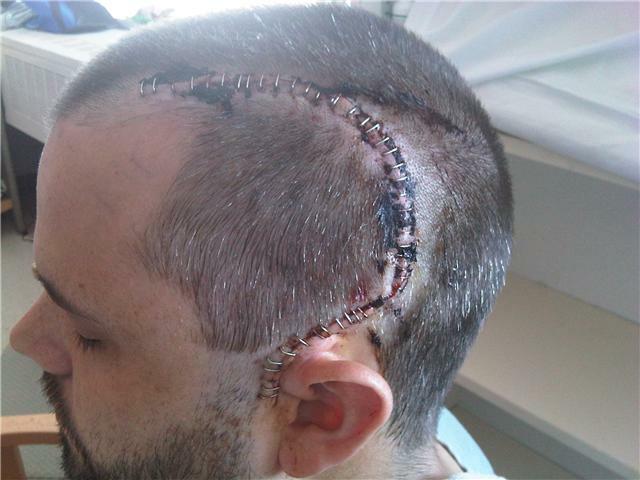 Brain tumour incision! Here is a shot of Pablo's head right after the tape was peeled off the incision about an hour ago. I'm glad I wasn't there to see it in person. This is 68 hours after surgery. (His nurse cleaned it up a bit after this photo was taken). Ouch! That looks quite painful, he is such a trooper! It kind of looks like a question mark! That is quite impressive! I hope he continues you heal well and you get great news soon. Wow, it's much bigger than I imagined. I hope he's feeling less pain today. He is doing far better today than the last two days although getting the tape ripped off that sucker of an incision was not a pleasant experience. And that is a whole lot of staples that are going to need to come out too...YIKES! My ex-husband and my son were/are both barbers. That's a good place to put the incision. It follows the hairline well. He's not gonna have a great hulking scar. My son got hit in the head with a 7-pound rock when he was about 7 years old. He and his best friend were playing 'war'. I thought I was gonna pass out when I saw him. Of course, his 'best' friend had helped the whole image-thing along by hosing him down outside before he came into the house ... yuck. Now you guys can start getting your lives back to 'normal'. Mine's bigger but size isn't everything. Looks like an Oligodendroglioma Left frontal lobe. Just celebrated 11 yrs of life post surgery. It's fascinating in a totally creepy sort of way. It's amazing the stuff they can do. Fascinating for sure. It was a damn big tumour so maybe that's why the incision was so big? I don't know. He definitely draws attention when we go for little strolls through the hospital. Jeff, there's bigger? HOLY CRAP! Congrats on the 11 years. Barb, I agree that he looked good when this was taken. Today, a bit different story. That's the same scar my two year old has.